A dizzying remake of the Shaw Brothers 1967 classic One-Armed Swordsman, Tsui Hark's The Blade (1995) seemed like a safe bet: Chang Cheh's original film was a box office smash in its native Hong Kong, with a strong influence that led to countless imitators in the decades to come. The Blade follows a number of characters (more on that later): it's told partially from the perspective of Ling (Song Lei), the only daughter of a saber factory master, who is attracted to employees Ding On (Vincent Zhao) and Ti Dao (Moses Chang). The former is appointed as her father's successor, but Ding On seems more interested in finding the mysterious tattooed man who killed his own father when he was a baby. More trouble is brewing in town, though: ruthless thugs run rampant in the streets, and the foundry workers take action after a Buddhist monk is killed. After a particularly nasty fight with them, Ding On is presumed dead when only his right arm is recovered later. Yet he's very much alive, resigned to "a normal life" as a one-armed man, but the continued interference of bandits makes him take up his father's sword and fight back. I've seen The Blade once before...and unlike most movies I revisit after a 10+ year window, my second viewing didn't really change my mind. It's the kind of film that plays better as part of a highlight reel than a stand-alone feature; poorly paced and overcrowded with subplots, even first-time viewers will be checking their watches on occasion or rewinding to make sense of a few ambiguous plot twists. 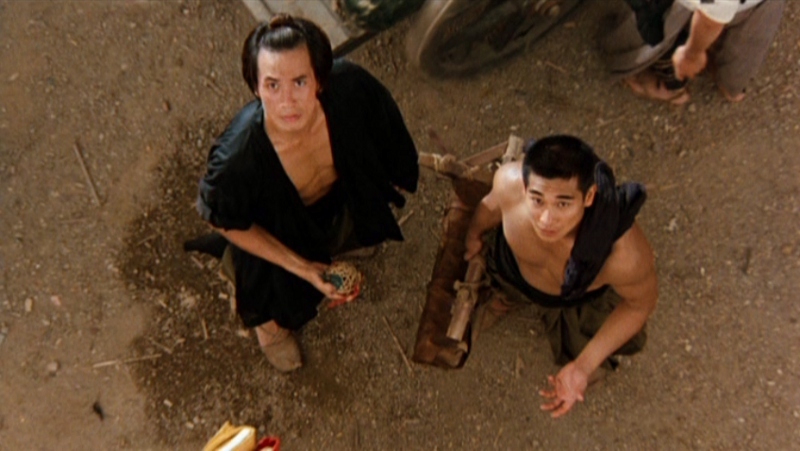 This is partially due to its confusing story (which might be the end result of a bad translation, to be perfectly honest), but some of the fight scenes are shot or edited poorly: often artificially sped up with plenty of close-ups, shadows, and quick cuts, you'll be hard-pressed to figure out what exactly is going on at crucial points in the film and left to play catch-up several minutes later. 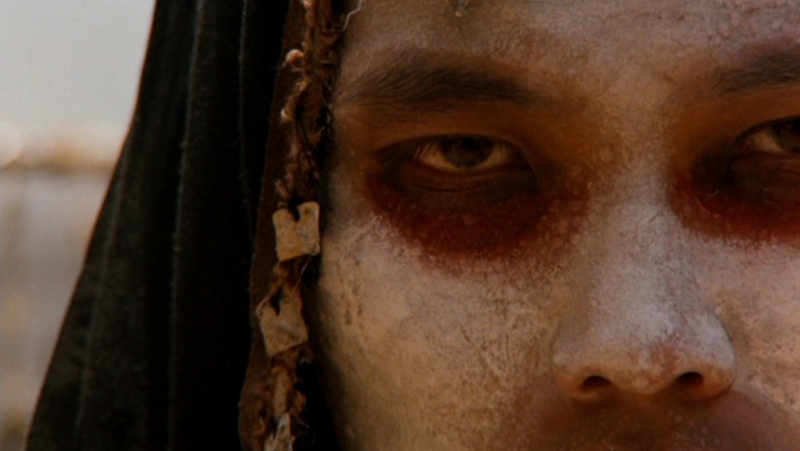 Revenge tales, even those that attempt to dig slightly below the surface as The Blade does, are best paired with a lean story and minimal distractions; here, we get an odd love triangle with too much voice-over narration, two heroes competing for screen time, an orphaned girl, and several dozen bandits with varying degrees of face paint. It's all too much weight for a 105-minute film that wants to be an epic, but falls short in both running time and overall execution. That doesn't mean The Blade falls short in every department, though: several of the film's brutal, fast-paced fight scenes are extremely entertaining, and the core revenge story contains a handful of deeper themes and a certain level of emotional release. Performances are fine, at least in the original Cantonese, although the overcrowded supporting cast threatens to distract just like the film's many subplots. As a whole, though, The Blade is far too messy to appeal to casual fans of the genre, and the ultra-serious tone might make you feel guilty for being drawn to its more visceral moments. In my humble opinion, it's the kind of film you watch once or twice and ultimately forget; an interesting experiment with a few memorable scenes that, nonetheless, falls flat too many times. Those who have developed a soft spot for it over the years, however, will appreciate finally having a good quality DVD copy available. Serving up a quality 480p transfer from what appears to be a fairly recent master, Warner Bros.' "Archive Collection" burn-on-demand disc easily outpaces anything you'll find on eBay or a Chinatown card table. It's not a definitive release, mind you...but as movie-only discs go, fans could certainly do a lot worse. Warner Bros.' new "Archive Collection" DVD is practically The Blade's Region 1 debut, as the only other known release was a 2007 disc of questionable origin (pan and scan, dubbed, no subtitles, etc.). This looks substantially better than that terrible effort: it's a very clean print with great colors, and the 1.78:1 widescreen format makes some of the fights (slightly) easier to follow. No flagrant manipulation or damage (excessive DNR, edge enhancement, ghosting, etc.) was spotted along the way, although I noticed some dirt/debris on the opening titles and a few stray vertical lines. Still, there's a lot to like about this surprisingly good transfer, as the film's occasionally vibrant colors and darker moments would have suffered greatly in lesser hands. The lack of a Blu-ray option is disappointing, obviously....but this is still a substantial leap in quality over the previous disc, so fans should be thrilled. Audio options include two Dolby Digital 2.0 mono tracks, either the original Cantonese or a predictably silly English dub. Neither option is particularly impressive, though it's undoubtedly due to source material issues and not the disc's fault: dialogue and fight scenes are relatively clear but there's little dynamic range or low end, which robs many moments of some much-needed punch. Music cues don't always fight for attention, but the high end sounds slightly clipped at times so it can't help but compete on occasion. The English dub is slightly fuller in direct comparison, and many effects have either been re-dubbed or added from scratch; again, this still isn't impressive work, and the voices and narration pale in comparison too. Optional English SDH subtitles have been included during the main feature...but these are "dubtitles", which means they're not a literal translation of the original Cantonese audio. Bummer. As expected, this burn-on-demand disc is housed in a standard black keepcase with poster-themed cover artwork, which makes The Blade look at least 20 years older than it really is. Unfortunately, there are no bonus features, despite the fact that an older Region 2 DVD included an hour-long documentary, an interview, the trailer, and more. The Blade isn't a particularly impressive film overall with uneven pacing, occasionally confusing fights, and an overcrowded plot that all distract from a few memorable moments. Even so, there's more here than what's on the surface: it's incredibly bleak, ambitious, and serves up several unexpectedly deep themes in what might otherwise be a standard revenge flick. The end result is still kind of a mess, but I'd imagine any die-hard fans of swordplay and violent imports will forgive some of its shortcomings, as will anyone who's seen The Blade in a lesser format and just wants to finally own a good copy. That's exactly what they'll get with Warner Bros.' new "Archive Collection" DVD: a very clean 16x9 widescreen image, and the added bonus of Cantonese and English audio options is appreciated (shame about the dubtitles, though). So aside from the lack of a Blu-ray option and missing extras, it's a decent effort...but unless you've seen and enjoyed The Blade already, this isn't a recommended blind buy. Rent It first.